Kindleberger's argues that there are three phases to a price process that occur during a financial crisis – mania, panic and crash. This is the more traditional view relative to other analogies such as a hangover or grief “model”. Manias take place during a business cycle expansion when economic agents switch from liquid to real or financial assets. The expansion changes risk perceptions and causes investors to believe that returns will be higher than historical patterns. Over-optimism about a business expansion coupled with cheap credit is the magic elixir for a mania. The asset mania does not have to be in all markets. It can be localized to markets which are going through large changes or where it is difficult to provide clear valuation. In fact, pricing of new technology is more likely to be mis-valued or have a mania. In the current case, there has not been much history on many new mortgages products and the CBO market is still in its infancy. The panic phase is characterized by a stampede, a race for changing real or financial assets into money. The demand for liquidity and safe assets causes excessive changes in pricing of the risky asset. New buyers for the assets to be sold have to be given a discount to take on the risk associated with the falling market. In many cases, the stampede can come from a single catalyst, an event that changes the perception on the valuation of the risk assets. The change in perception could be as simple as a change in the price momentum. In the case of housing, a slowdown in the ascent of residential real estate was enough to start to have an impact on the ability of some borrowers to pay for their loans. Crash is the final outcome of the process preceded by panic and mania. The crash comes when there market becomes a one way bet against the asset. Expectations are all negative and there does not seem to be a reversal in negative fortunes in sight. These stylized descriptions provide more contexts for explaining a financial crisis but also have a problem of not being precise. What is the difference between a panic and crash? What are the visible signs we have made the transition. Compared to these phases, a focused model can be summarized in five different, yet relatively contemporaneous stages of displacement, boom, overtrading, revulsion, and tranquility. Having five stages may seem a little better, but again there are not precise definitions for these periods. There is no measure to say how long it will take to move from one phase to another. However, with real estate, the time it will take to resolve the crisis will be longer than for assets that have to be market to market. If there is not forced selling, a home-owner can always wait before realizing a loss The problem with this crisis is that the sensitivity of homeowners to changes in the mortgage rate is greater than what we may have seen in past recession where everyone was locked into fixed rate financial. You can provide any number of descriptions for the crisis, but what is needed are a set of policy alternatives. Solution part of crisis is harder to describe. 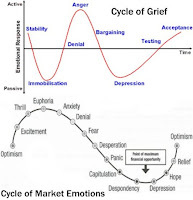 An interesting perspective on market cycles was presented in cashandburn.com with a chart on grief modeling. Using the stages of grief developed by Elisabeth Kubler-Ross in her book On Death and Dying, we may say that the credit cycle follows a similar form. One more investment analogy but is a variation of some of the behavior models where investors do not want to realize loses. The credit boom in housing had to die and we have to accept it before the markets can move on. There is a growth cycle in any business. (Note that we have also presented the hangover analogy in our last blog.) The market was in denial that the lending game was up with mortgages. We have been through that initial stage with the housing market peaking over 2 years ago. Some home-owners may still be in a state of denial by keeping their home prices up in the resale market. Investors have tried to bargain their way out of this problem but that has not proved to be a solution. There is the the view that there is some way to get out of the crisis without paying a penalty. Many are in a state of depression. There are a host of managers who are asking the question of how did this happen to them. We are testing the new regime and learning to accept it, so to some degree there are people who have figured out how to move on with their grief. Others are still in the middle of the process. The market will not be ready to move up until this grief process has concluded for the majority of investors. An interesting discussion on Brad Delong’s blog posted a comment on the hangover theory of financial crises by Paul Krugman. Worth a look. It makes a good comment on how many often to make a market bust a morality play. Bad things happen to bad people who try and get greedy in financial markets. We party hard during the boom and there is a price that will have to be paid by everyone. We already see this story unfolding in the media. The consumption portion of the Krugman tale is a little more problematic. Investments creates wealth if the value of the investment goes up. These investments are valued or priced based on their use in the economy. If they are no longer productive, there will be a decline in value associated with this investment which will decrease the wealth of consumers. This wealth effect changes consumption in the bust portion of the cycle. It is not a swtich between consuming or investing. Call it the overinvestment theory of recessions, or "liquidationism," or just call it the "hangover theory." It is the idea that slumps are the price we pay for booms, that the suffering the economy experiences during a recession is a necessary punishment for the excesses of the previous expansion. The hangover theory is perversely seductive--not because it offers an easy way out, but because it doesn't. It turns the wiggles on our charts into a morality play, a tale of hubris and downfall. And it offers adherents the special pleasure of dispensing painful advice with a clear conscience, secure in the belief that they are not heartless but merely practicing tough love.... The many variants of the hangover theory all go something like this: In the beginning, an investment boom gets out of hand... all that investment leads to the creation of too much capacity--of factories that cannot find markets, of office buildings that cannot find tenants... reality strikes--investors go bust and investment spending collapses. The result is a slump whose depth is in proportion to the previous excesses. Moreover, that slump is part of the necessary healing process: The excess capacity gets worked off, prices and wages fall from their excessive boom levels, and only then is the economy ready to recover. Except for that last bit about the virtues of recessions, this is not a bad story about investment cycles.... But let's ask a seemingly silly question: Why should the ups and downs of investment demand lead to ups and downs in the economy as a whole?... Here's the problem: As a matter of simple arithmetic, total spending in the economy is necessarily equal to total income (every sale is also a purchase, and vice versa). So if people decide to spend less on investment goods, doesn't that mean that they must be deciding to spend more on consumption goods--implying that an investment slump should always be accompanied by a corresponding consumption boom? And if so why should there be a rise in unemployment? Once again, the law of unintended consequences exists. In an effort to save the environment, we have pushed the issue of renewable green fuels like ethanol. This created a growing, consistent and subsidized, demand for corn. The ethanol demand for corm is growing to be above one-fifth of the entire crop. The response should be as expected, higher prices. But once there was a supply shock to the system and a increases demand for grain-feed beef in developed countries, the response of farmers was natural. They wanted to plant more. The only land left was the acreage put aside or conservation. Farmers were made to leave this land alone but at some point the price difference is too great. So much for conservation. Of course, the unintended consequence of leaving cropland fallow as a conservation effort is also having an impact on the cost of bread. The effort for green energy destroys conservation land. Now that is environmental story that we never thought would happen. New BOJ Governor - more of the same? Masaaki Shirakawa, the acting head of the Bank of Japan will be announced as the new governor of the central bank. The politics of picking the governor has left uncertainty about what will happen to Japanese monetary policy, but the pick of Shirakawa, a long-time bank veteran is said the be in lock step with the previous governor. So what can we expect? One simple way is to look at his writing. We get a good view of Bernanke from his academic work, but Shirakawa has not been a prolific writer. There is one BIS piece on monetary policy with a number of authors, “Japan’s deflation, problems in the financial system and monetary policy” Naohiko Baba, Shinichi Nishioka, Nobuyuki Oda, Masaaki Shirakawa, Kazuo Ueda and Hiroshi Ugai of the Bank of Japan. 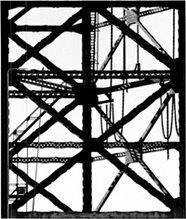 http://papers.ssrn.com/sol3/papers.cfm?abstract_id=861664]. This paper is a reflection on the current state of thinking of central bank action during the zero interest rate policy (ZIRP) and the quantitative easing policy (QEP). This work is interesting reading because it places the focus on asset price deflation not general price declines as the leading problem in Japan during the “Lost Decade”. Understanding what the BOJ Governor may do is relevant because with Japanese growth declining there is more likely to be a change in policy. Some analysts are currently expecting a cut in rates as early as next month. The good news is that it is unlikely that we will get any change in central bank strategy, so there will be limited policy uncertainty. It also means that we are unlikely to get a strong central bank voice. Are we afraid of free trade with Colombia? Editorial from George Will on the Mark Penn firing touches at the heart of the bigger policy issue. The real concern is whether we fall back into protectionism by one or both political parties. Maybe it is time to start listening to some off the simple facts on trade. Austan Goolsbee, Obama's economic adviser, has said that "60 to 70 percent of the economy faces virtually no international competition." America's 18.5 million government employees, among whom organized labor finds its growth, have almost no vulnerability to foreign competition, and neither do auto mechanics, dentists and countless other professions. Furthermore, Goolsbee, with whom Obama might profitably have a conversation, has said that globalization, meaning free trade and attendant deregulation, is responsible for a "small fraction" of today's widening income disparities. Under the Andean Trade Preference Act, passed by a Democratic Congress is 1991, the United States imposes tariffs on only 8 percent of imports from Colombia. But more than 90 percent of U.S. exports to Colombia are subjected to tariffs, some as high as 35 percent. The trade agreement would make this "one-way free trade," which now primarily serves Colombia's interests, more mutually beneficial. Nevertheless, U.S. unions oppose the agreement, probably to preserve the moral clarity of their monomania: Damn the details, full speed ahead in opposing more free-trade agreements, anywhere, anytime. The financial world is changing, are we ready? As Wayne Wagner, a market expert, recently stated, “We walk backward into the future, with our minds anchored by the imprinted lessons of the past.” Whether it be monetary policy, the reaction of credit spreads or the link between the US economy with other countries. We are going through a transition and the old ways of looking at the markets. As John Maynard Keynes put it way back in 1923: “In the long run we are all dead. Economists set themselves too easy, too useless a task if, in tempestuous seasons, they can only tell us that when the storm is long past the ocean is flat again.” The fact that this credit crisis will be over at some time tell us nothing about how we should deal with the markets today. So what are the prevailing biases in markets? Why I follow behavioral finance?